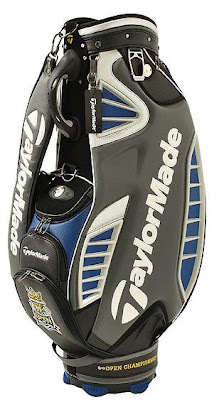 Following the action at the 2009 Open Championship how did I fail to notice these great commemorative British Open Staff Bag from TaylorMade. All their staff are using them this week even Canadian Mike Weir how could I have missed them. Good thing our friends over at GolfToImpress.com were kind enough to post some pics and give us golf fanatics something to droul over. I've never owned a large Staff Bag like this but seriously this is a beauty from the color down to the fine details of the traditions of golf in Scotland and at Turnberry. Nice one TaylorMade. "On the front of each bag is a large version of the logo on the right. The "RB" in the crown is for Robert the Bruce, who was born in Turnberry Castle in 1274. Eight years after being crowned King of Scots in 1306, his army defeated England's and won freedom for Scotland. The four red jewels in the crown represent the Open Championships contested on Turnberry's Ailsa Course (1977, 1986, 1994 and 2009). Golf fans should easily piece together what the sun, crossed swords and 77 symbolize—Tom Watson's victory in the 1977 Open over Jack Nicklaus that has come to be known as "Duel in the Sun." The dark mound rising from the water represents Ailsa Craig, the volcanic island 11 miles off the coast of Turnberry in the Irish Sea. Expect to see lots of photographs and images of Ailsa Craig during this week's Open coverage. The crossed white stripes on the blue background at the bottom symbolize the national flag of Scotland." If you want one be sure to check out GolfToImpress.com they have them in their store.